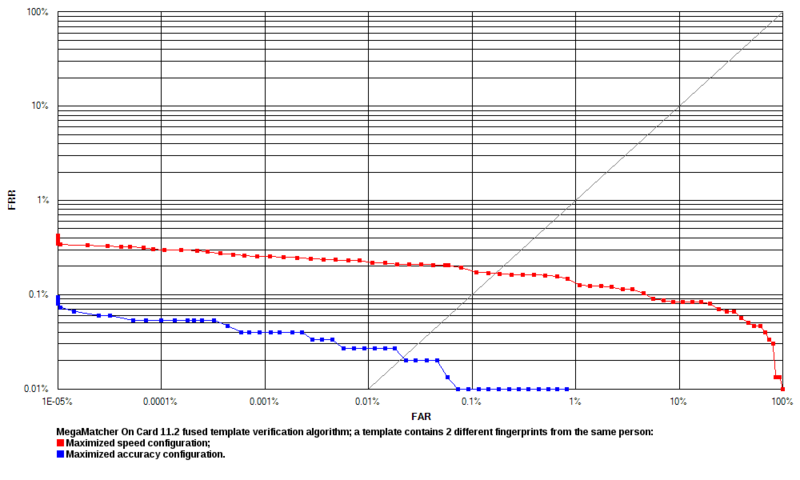 ±180 degrees (unlimited) fingerprint rotation tolerance value was used for template matching in the maximized accuracy configuration. Face verification. 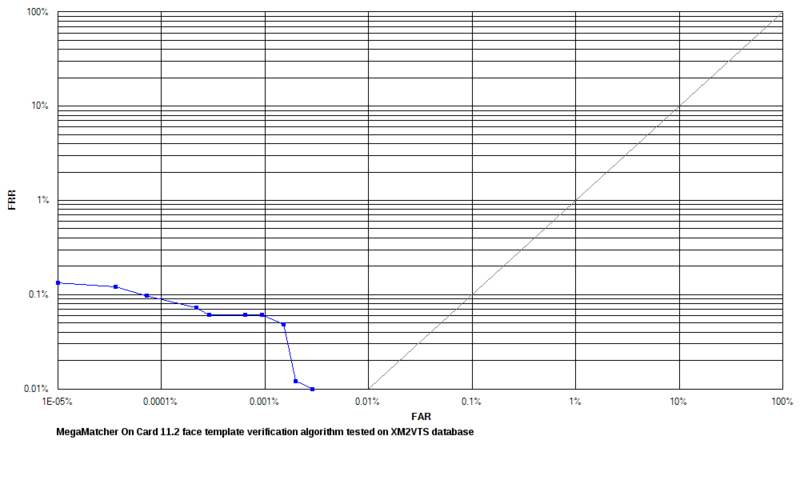 The tests were performed using face images from XM2VTS database. Proprietary compact template format was used during testing. ± 15 degrees iris rotation tolerance value was used for template matching. The database had 7,500 sets of biometric records; each set contained 1 face, 2 irises and 10 fingerprints representing a unique person. 1,500 unique persons were represented in the database. 5 capture sessions were performed for each person. 1 fingerprint record – taken from left index fingerprint. 1 iris record – taken from left eye image. 2 fingerprint records taken from same person's left and right index fingerprints. 2 iris records taken from same person's different eyes. 1 fingerprint + 1 face records left index fingerprint and face taken from the same person. 1 face + 1 iris records left iris and face taken from the same person. 1 fingerprint + 1 iris records left index fingerprint and left iris taken from the same person. 1 fingerprint + 1 face + 1 iris records left index fingerprint, left iris and face taken from the same person. Experiment 1 maximized matching accuracy. The experiment was performed with all template types. 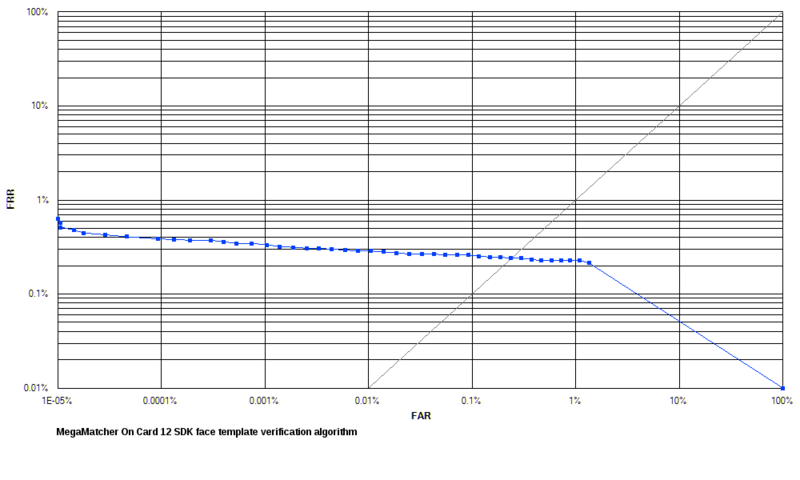 MegaMatcher On Card 11.1 algorithm reliability in this test is shown as blue curves on the ROC charts. Experiment 2 maximized matching speed. 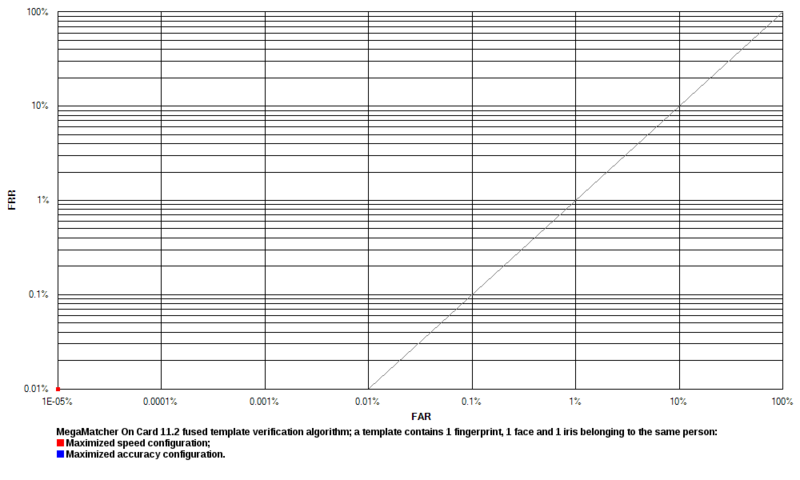 The experiment was performed only with template types that contained fingerprint records. 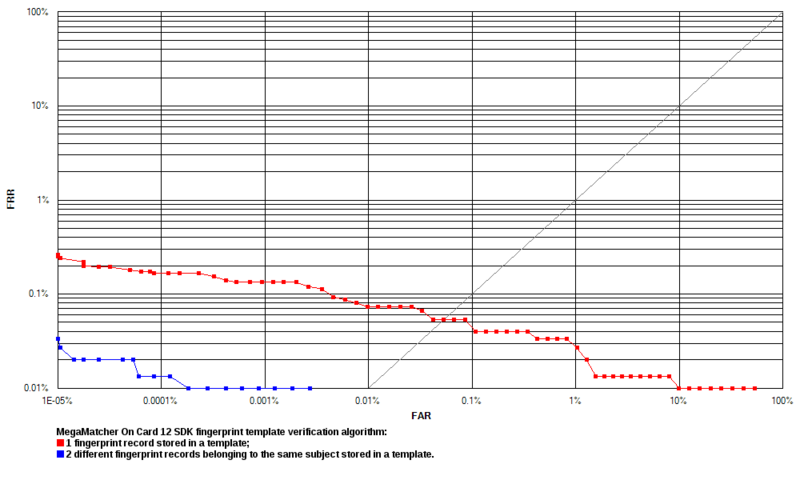 MegaMatcher On Card 11.1 algorithm reliability in this test is shown as red curves on the ROC charts. 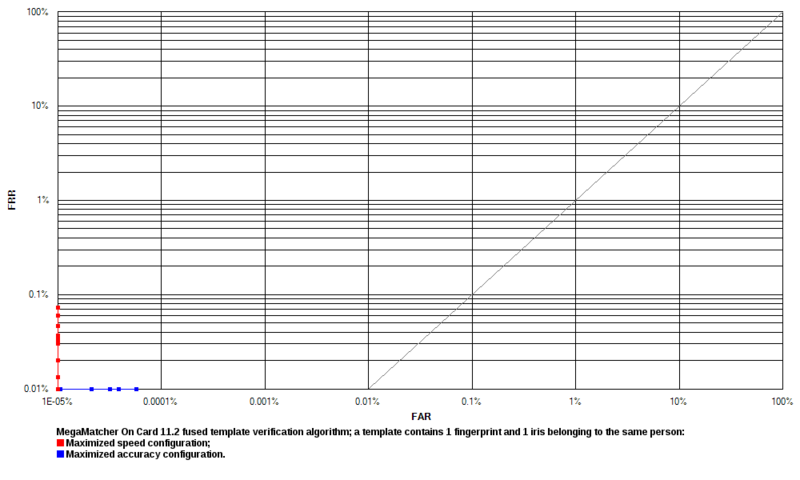 MegaMatcher On Card 11.1 fingerprint, face and iris matching algorithms were tested on smart cards from several vendors. The matching speeds are available below. Please contact us to get more information about the expectations on a specific platform on which you intend to use it. 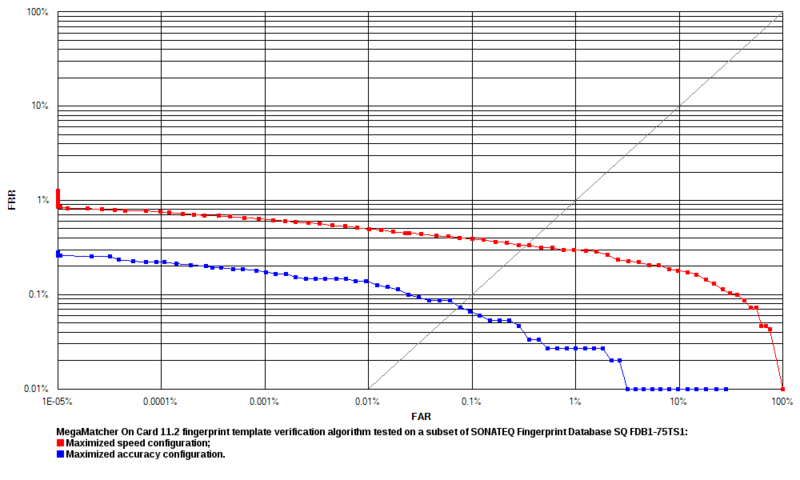 (1) The performance on a specific smart card depends on the hardware chip platform, OS, also on-card matching algorithm integration level and the memory space it is being executed from. 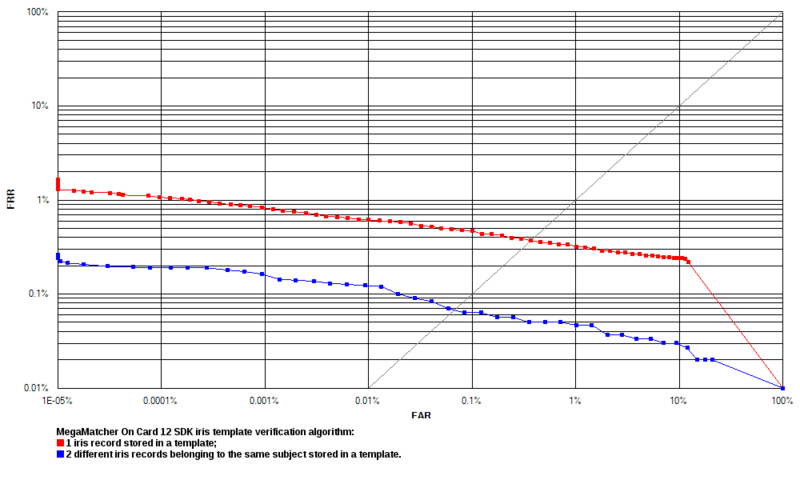 The verification times are provided as ranges, with the lowest values corresponding to the averages of the tests on appropriate OS smart cards with the fastest performance, and the highest values – with the slowest performance. (2) Performance depends on the maximal number of minutiae features within enrolled and verified fingerprint templates. 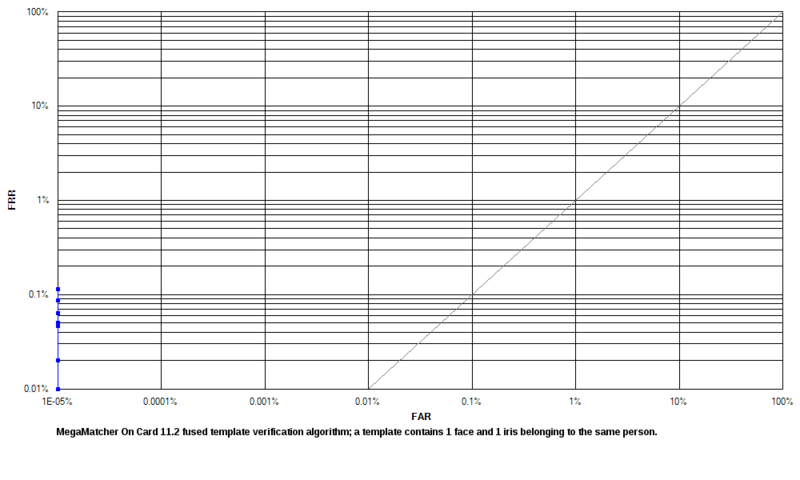 Results correspond to matching test of an enrolled and verified templates each containing 48 minutiae. Contact SCR335v1 USB smart card reader was used for PC/SC communication. 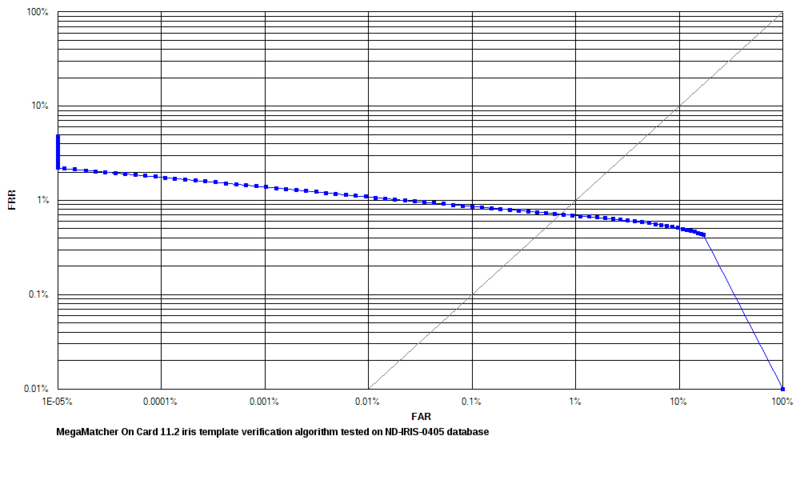 (3) Performance depends on the baud rate of contact or contactless protocol and APDU type chosen. 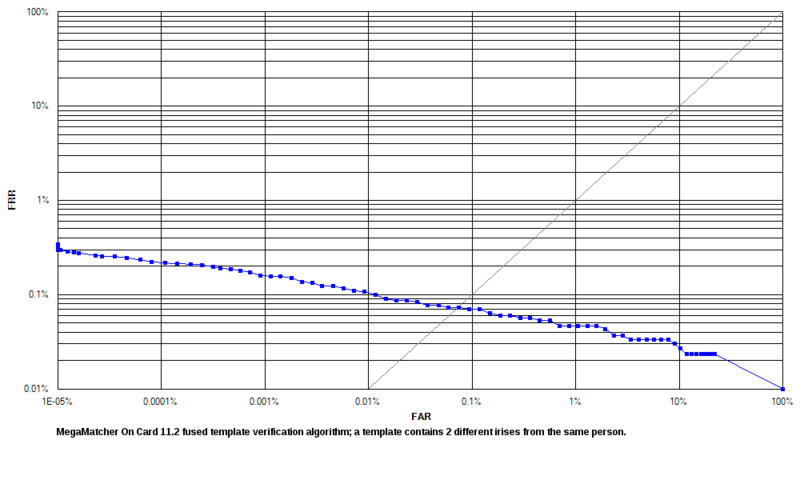 Results correspond to matching face and iris compact card format templates using short length APDUs. Timings are available for contact interface tests using SCR335v1 smart card reader.